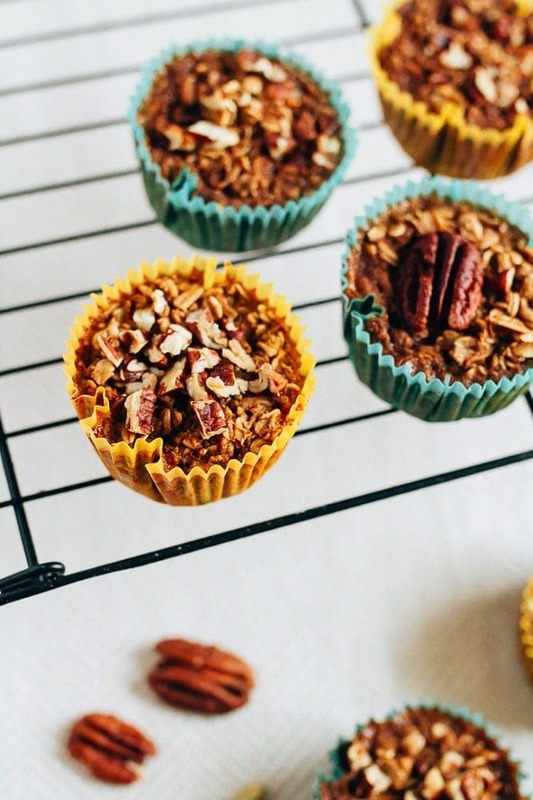 Healthy baked chai oatmeal cups are a great way to take oatmeal on the go. You’ll love how easy they are to make and the cozy chai flavor. This post is sponsored by REBBL. Oatmeal is one my favorite things to have for breakfast. 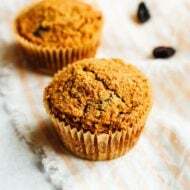 I LOVE it, but for busy mornings when I’m running to a workout class or a meeting I need something I can take on the go and oats just aren’t very portable. Eating a bowl of hot oats while driving — risky business. Packing a bowl of hot oats to eat once you arrive to your destination — definitely not a good idea, unless you like cold, gluey oats. That’s where these baked oatmeal cup come in handy. You can make them ahead of time, reheat and enjoy. They’re super portable and you eat them just like you would a muffin. 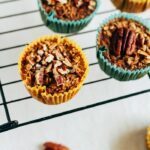 I’ve made baked oatmeal cups before (see these pumpkin oatmeal cups and these banana oatmeal cups) but this chai version is a little different, in a good way. These cups are made with REBBL’s Ashwagandha Chai elixir, which is a blend of creamy coconut milk, chai spices and the super-herb, ashwagandha. Ash wag and ha, what?!? Let me explain a little. Ashwagandha is an Ayurvedic adaptogenic herb. Ayurveda is a holistic, alternative medicine system developed in India thousands of years ago. You’ve probably heard people talk about their dosha or toss around the words vata, pitta and kapha. Their talking about the mind-body classifications used in ayurveda. And adaptogens are herbs that are those that help the body adapt to physical and emotional stress. They have a normalizing effect and are non toxic. Ashwagandha is a widely known adaptogen and is used to help support sustained physical endurance, improved cognitive function, recovery and relaxation. <– Reduced stress? I’m in! 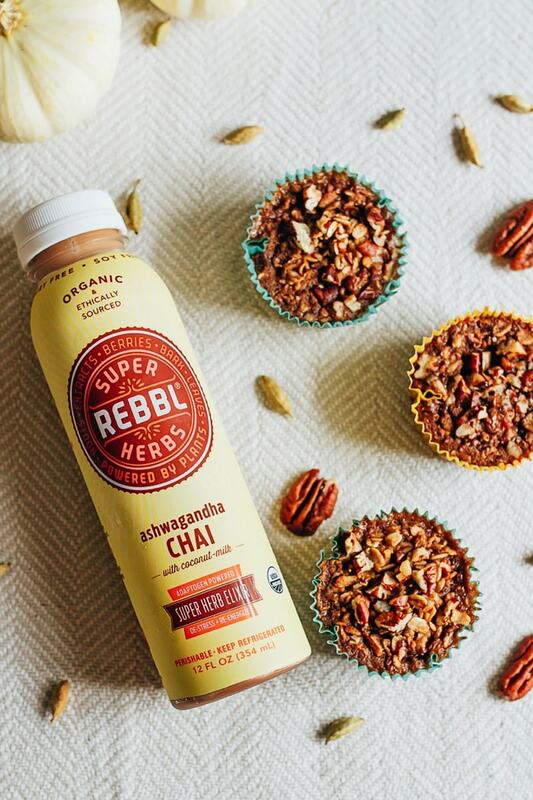 REBBL’s ashwagandha chai drink is delicious and tastes like an iced chai latte — it doesn’t taste medicinal or herby at all — but you get all those benefits I mentioned above. 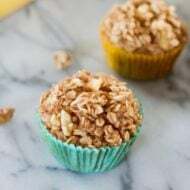 I love having it in the morning or as an afternoon pick-me-up, but it works perfectly in recipes, like these chai oatmeal cups as well. If you’re a chai lover, you will go wild for these cups! They smell amazing while they’re baking (kind of like the holidays) and they taste delicious. 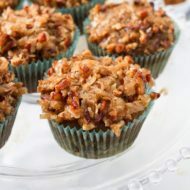 You’ll love the spice blend of cinnamon, cloves, ginger and cardamom as well as the crunchy pecan topping. I shared a few of these cups with Maria, but most of them were devoured quickly by me. They’re delightful reheated in the toaster oven with a little almond butter drizzled on top! I hope you enjoy them as much as we do. 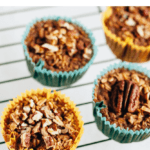 If you make these healthy baked chai oatmeal cups, please let me know how they turn out in the comment section or share a photo on social media. Just remember to tag me (@eatingbirdfood) so that I don’t miss it! 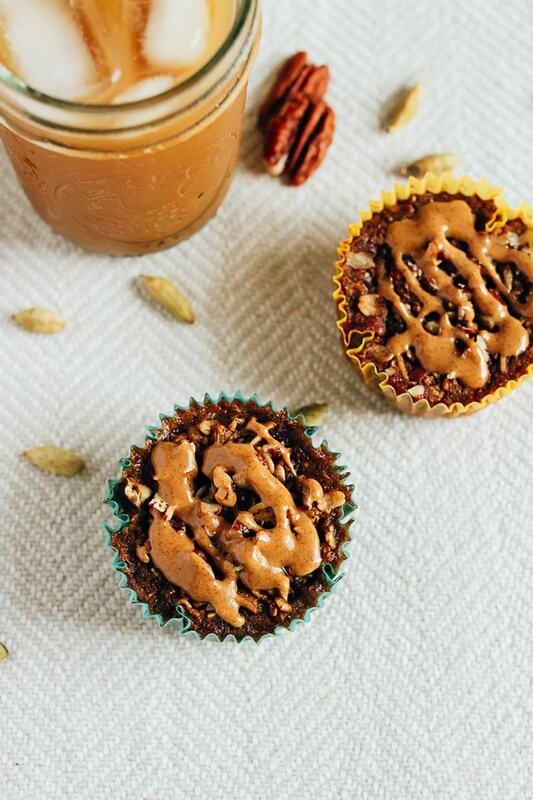 These baked chai oatmeal cups are perfect for taking oatmeal on the go and have such a lovely and cozy chai flavor. Preheat oven to 350°F and spray one 12-cup muffin tin with cooking spray or use cupcake liners. Silicone liners work great! In a bowl mix together oats, salt, baking powder and spices. In another large bow whisk together chai drink, egg whites, maple syrup, oil, vanilla . Dump dry ingredients into wet ingredients; mix well. Gently stir in pecans. 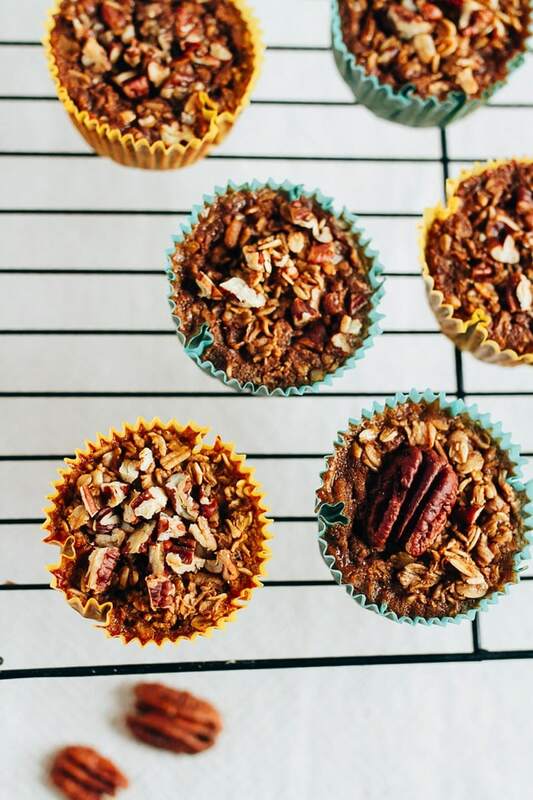 Bake 30-35 minutes or until the center of each baked oatmeal cup is set and a toothpick comes out clean. Allow cups to cool before eating (the cupcake liners are much easier to get off once they have cooled). Store in the fridge or freezer and reheat the cups in the toaster oven or microwave when you’re ready to eat. When frozen take them out of the freezer and put them in the fridge the night before to thaw. Toast or microwave for a few seconds before eating in the morning. 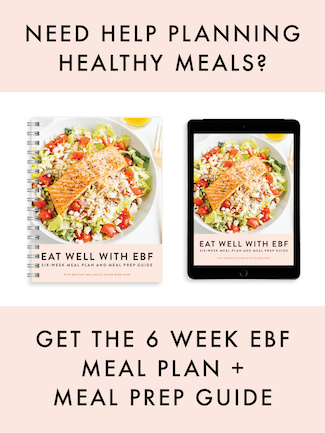 Thank you to REBBL for sponsoring this post and thank you for supporting brands that make EBF possible. As always opinions are my own. These look fantastic! Definitely will be trying them, thanks! Your new blog design is beautiful, Britt. These look so healthy and delicious! Perfect for busy mornings! oh wow these look amazing, thanks for sharing! I wanted to make chai overnight oatmeal but this looks like a fantastic idea too! Portable and delicious! 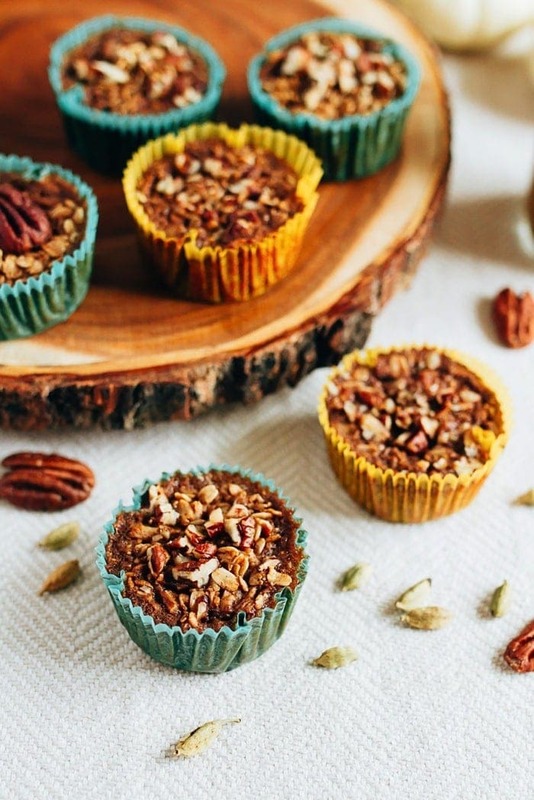 These oatmeal cups sound delightful — how perfect for on the go! Do you think they would work with flax egg replacement, have you tried?